Nighttime eating can be difficult to avoid, especially if you're feeling stressed. In some cases it can even become a disorder, such as night-eating syndrome, a condition that is particularly prevalent in people who are obese or morbidly obese, according to Family Practice News. In general, the longer you stay awake, the more prone you are to eating large meals before bed, which can lead to unpleasant side effects. Also known as GERD or acid reflux, this condition occurs when the sphincter muscle at the back of your esophagus doesn't close properly and stomach contents leak back into your esophagus, causing irritation and discomfort. It can be aggravated by eating large meals before bed. Eating triggers acid production, and lying down right after can cause acid to flow back up through your esophagus. If you're prone to this condition, it's best to wait two to three hours before going to bed. A major drawback of eating large meals before going to bed is disrupted sleep. Once you eat, your metabolism fires up, which makes it difficult to fall asleep and sleep soundly. Also, lying down with a large amount of food in your stomach can be uncomfortable. A lack of sleep increases daytime fatigue, interferes with memory and concentration and increases hunger and your appetite. Don't eat within two to three hours of your bedtime. Although pathological nighttime eating is linked to obesity, the debate about whether occasional eating before bedtime leads to weight gain rages on. For instance, in 2009, a mouse-model study conducted by Northwestern University led by doctoral student Deanna Arble revealed that eating in the middle of the night influences weight gain. However, previous studies, including one published in the journal "Eating Behaviors" in August 2003, found no link between weight gain and late-night eating. It's possible that the type of calories you consume — for instance, low-fat protein versus fatty foods — the amount and your activity level make a difference. One of the easiest ways to avoid eating large meals before bed is to go to sleep earlier. The longer you stay awake the more you're likely to feel peckish and to give in to temptation for unhealthy foods. 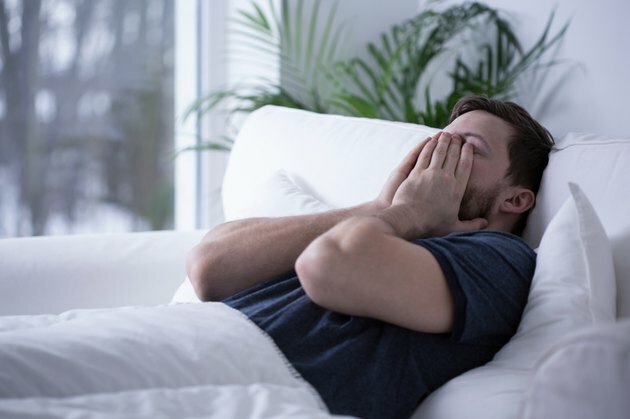 If you have difficulty falling asleep, try going to bed at the same time each night, turning off your computer and TV an hour before bedtime, using white noise such as a fan or taking a warm bath an hour before going to bed. Finally, if you've been suffering from compulsive late-night eating and other health problems such as obesity and sleep apnea, consult your doctor for more advice.